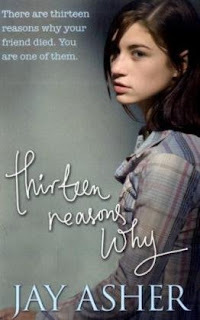 To Read or Not To Read: Thirteen Reasons Why by Jay Asher. Written above is what Thirteen Reasons Why is about, It's a book I've been wanting to read for ages but there's so many mixed emotions and reviews on it that I thought I'd ask for the best people's opinions and they are. My Followers! (Or whoever reads this post). I've read reviews that say they loved it and even reviews that stated they hated it. Then some mixed reviews as well. Even though I know I shouldn't listen to what other people think I do anyway cause I like to know if I'm going to read a good book or not. It wasn't until I'd read Natalie Framptons Review of Thirteen Reasons Why that I'd finally decided *I'm going to read this book*. Her review is so honest and strong. I'm going to admit it's the best review I've ever read she has wrote such an amazing view on the book. You can read her review by clicking (Here). I'd like to thank Natalie for letting me link up her Review to this blog post. THANK YOU!! :) Check out her wonderful blog Besotted with Books. Have you read Thirteen Reasons Why? What did you think of it? Feel Free to link your review of the book in the comment section below I'd love to read what you thought. If you ever felt a little picked on in school or wished that your day could have gone off in a different direction, then you may be able to relate to this book. If you have never worried about the opinions of others or thought of yourself as an equal or less than equal to anyone else, you will not like this book. This one is only good for those with empathy and an open-mind.